A Work In Progress: One Middle-Aged Broad's Descent Back Into Horse Madness! : Ah-hah! An Epiphany! Cue choirs of heavenly angels, seraphim, and whatnot. 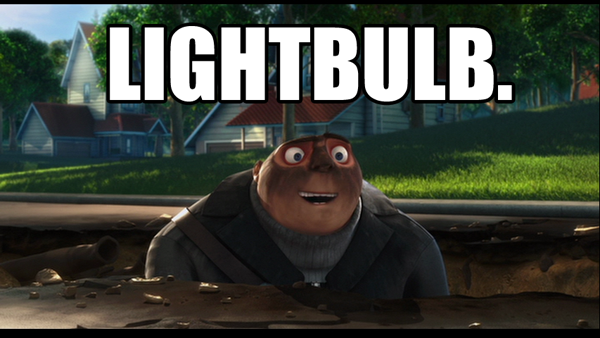 Seriously, it was a real "Light bulb" moment. Complete with expression of dawning comprehension and a cartoon light bulb appearing over my helmet. OK, so I'm not Despicable Me's villain-in-his-own-mind Gru, but you get the drift, right? I was taking a jumping lesson and it was going well. I was keeping a good rhythm, and most of my distances were good ones. The ones that weren't actually were not too bad, just a bit deep, and I was able to adjust my plan to the next fence accordingly. The light bulb moment came when I was discussing my ride to a particular fence with my trainer. I was deconstructing what I'd done, telling her that I'd ridden the approach too far out, saw a funky distance and realized I'd need to adjust and ride the mare up a bit and that's why the spot was a bit too long. "I didn't mind the spot at all," she replied. "You can't always get a perfect distance. You don't NEED a perfect distance. You just need to get them to a spot where they can jump." Hmmm? Perfection isn't necessary? Mediocre is acceptable?? I don’t need to pick-pick-pick my way down to a fence to find the perfect distance??? Awesome!!!!! For whatever reason, in the past I’ve put myself under so much pressure to find the perfect distance it damn near incapacitated me. Maybe I believed the perfect distance would be some potent magic that would keep the mare and me safe. Maybe the ability to find it meant I was a good rider. I don’t know. I do know that I made a conscious decision to spend the past 9 months at my new barn going back to basics in what I call Remedial Jumping, or Jumping for Dummies. Instead of jumping 3” or more and feeling like I barely survived (perhaps an overly dramatic assessment, but that’s how I felt) I’ve been jumping 2’ fences, concentrating on producing a canter with impulsion and maintaining constant rhythm. The “magic canter,” as my favorite clinician, Eric Horgan, would call it. I’ve found that if I maintain impulsion and rhythm, even if I don’t get the “perfect” distance, I often get a pretty good one. In other words, I get the mare to a spot where she can jump. She takes care of the rest. If I get too deep, we still have enough impulsion that I can leg her on and fix the rhythm before the next fence. If I’m slightly long, so be it, I sit up and re-establish the rhythm move on. The way I rode before, I would pick down to one fence, jump from a deep spot, desperately try to reorganize, and then run like hell to the next fence. Then I’d feel panicked and overwhelmed, micromanage her to the next fence, chip in, panic, and gun her to the one after that. Ad infinitum. Giving myself permission to step back and reassess gave me the opportunity to rework my riding and address some key weaknesses. I still have goals, but have realized they are not about the height I jump or how I place in shows. For me, it’s about the riding. Am I improving? It’s not like I’d never heard the whole “rhythm will help you with distance” thing before, but hearing it in a lesson or two or a clinic is a lot different than forcing yourself to take a step back and work on nothing but a specific weakness until you fix it. I’d been approaching the whole thing bass-ackwards backwards before, and now that I’m coming at things from a different perspective it feels like things are coming into place. I’m more confident when I approach a fence or a course. I actually want to jump more, not less. Okay. So maybe it’s taken a while. I never claimed to be the brightest bulb in the string. But hey, while I may not be the brightest bulb, but I certainly had my LIGHTBULB moment!